It's been raining so much around here that I've been stuck inside wondering when I'll be able to go outside and play in the garden. In the meantime, waiting for the sun to come out and dry things out, it's always fun looking around the house to see what you can get into and make! Don't you just love a project that uses stuff you already have and cost next to nothing to make - like this adorable flower basket cart made out of newspaper? Just perfect for summertime! Here's how you can make one, too! 1. Fold a newspaper section in half and fold again so you have four sections, and crease. 2. Cut out the four folded sections and open . 5. Just before finishing the tube roll, add glue to the corner end tip and continue rolling until reaching the end to seal. You will need to make about 15 tubes - depending on the size of the basket you want. making sure the tubes are side by side. Next, take one end tube and begin weaving it around the other tubes, over and under, moving around in a circle, keeping tubes as close together, as possible. Lengthen the weaving tube by adding glue in the tube opening and inserting a new tube. Continue weaving tube around, over and under the other tubes, lengthening as you weave. Once you've created a good round basket base, place over the bottom of an upside down plastic container about the size of a basket you want to make and continue weaving around and lengthening the tube until reaching the end. It was easier for me to used a candle holder to set the container on while weaving. Once you reach the end, glue down the weaving tube horizontally along the basket. Clamp in place until dry. Cut off vertical tubes, leaving enough to fold over, while adding a bit more glue and inserting into the woven sides to seal. To make the cart wheel, flatten a new newspaper tube and wrap around a small cylinder shape, like an ink pen, adding a bit of glue as you roll. Once you've rolled the wheel size you want, seal with additional glue and let dry. Carefully remove pen. Next, cut the straight wire off of the hangers and insert each one into a newspaper tube. Insert the wire tube into the wheel opening, half way and bend into a V shape. Next, place the other wired tube across the bent tube. Place the basket on top, adjusting the space between for support and placement. Remove the basket and glue the straight tube in place. Strengthen tube connections by wrapping cording in x-shape around tubes, knotting and cutting off excess. Gently bend the long wired tube straight down on each side and then into a V-shape for cart stands, cutting off excess tube and gluing in place. Glue on short horizontal bar for more basket support. Glue on basket to cart base, curling the cart handles and gluing together . . .
and then, painting it all. This adorable flower cart makes for a lovely floral arrangement accent piece - especially during the summer! 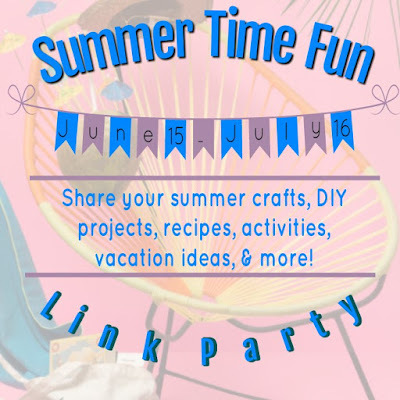 I've joined a group of creative blogging friends to bring you a month long Summer Time Fun Link Party starting on June 15th, where we share our crafts, DIY projects, recipes, activities, vacation ideas, and more! 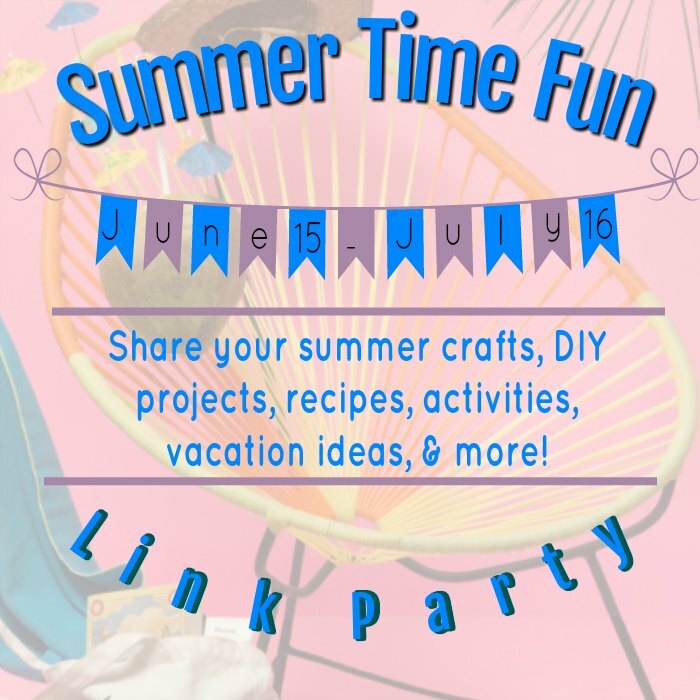 Be sure to stop by and join in by linking up and sharing your posts on all things summer! Wow, that is just brilliant, you'd never guess it was newspaper. You have such a talent for taking ordinary items and using them for lovely projects, Gail! This is amazing Gail. I couldn’t believe you made the whole wheelbarrow with newspaper. You are so creative, it’s beautiful! Gail, you are a serious genius at repurposing. I thought this was a bought basket and never guessed it was made with newspapers. Blown away. Pinned. Wow! You always blow me away with your projects! I would never have thought this was made using newspapers. Pinned. Wow Gail to make something out of nothing is truly a talent and you have got this in spades. So impressed. Excellent Tutorial as well. Great project! Super cute and cleverly done.😄 I just love it. What a fun idea! It's crafting and recycling all in one!